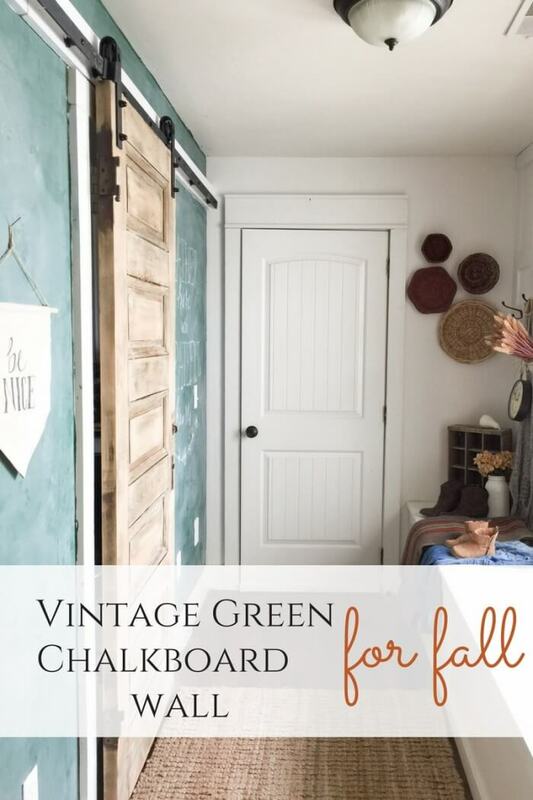 Yesterday I posted a tour of my vintage farmhouse breezeway, and I wanted to show you a little bit more about why I painted my wall vintage green and hwo I like to decorate it for fall. I didn’t really know what I wanted to do. 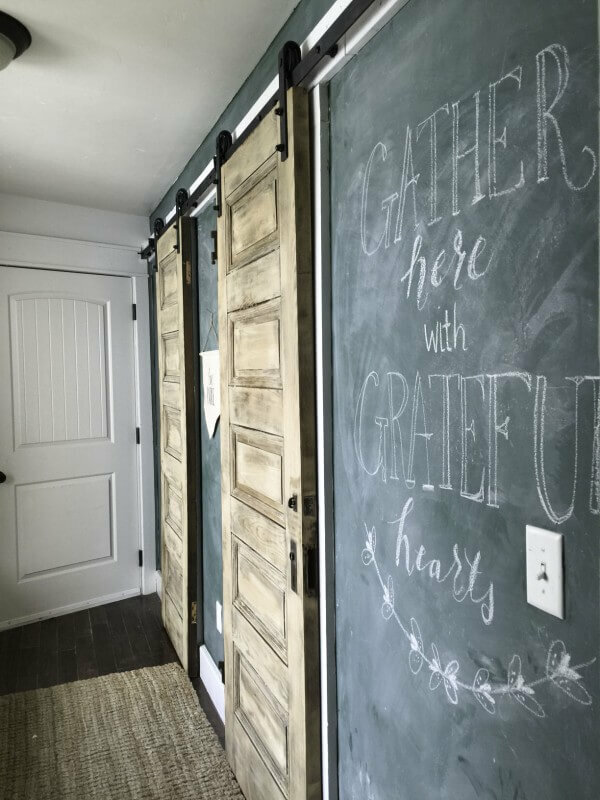 I was at the hardware store picking up a few items for my laundry room, including some black chalkboard paint for some other projects I had going. A few days later, I headed out to the garage to get my black chalkboard paint for a project, only once I opened the lid I realized….I bought green chalkboard paint. Wait, what? I hadn’t even bothered to look at the can at the store! Doh! Well, since the store is approximately 90 minutes away from where I live, I decided returning it right away was not an option. So, I did what I do best. I improvised. Before I knew it I was painting over my black chalkboard wall with green paint. I think sirens started to sound. This is not my way. I don’ t usually go out and paint something with such a bright color. I got about half way through, and started to panic. Oh my gosh, what had I done! What if I don’t like it? I don’t have any other paint to fix the problem! I carried through, hopeful my thoughts would change. The wall got done. Oh my hell, its green. Like really green! I told myself not to panic. Then I remembered I needed to season it. I covered the whole thing in chalk, coloring it all in with an even layer of chalk. I then rubbed it all in with a clean towel, making sure not to wipe it off but to rub it in. Well, what do you know. 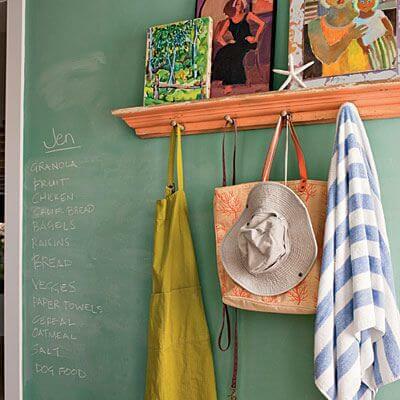 Seasoning tones the wall down dramatically, creating a really nice vintage chalkboard wall. I made sure to take pictures and send them to my sister to make sure I was headed in the right direction. She agreed, and so I was satisfied. Every once in a while, I I would have a sting or regret, just because, you know, I cannot be content. But, I have come to totally and completely love it. 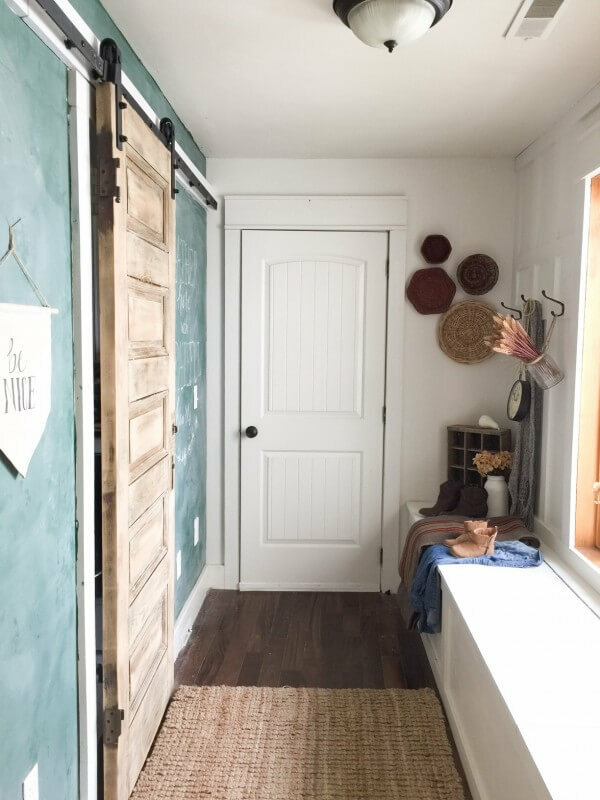 It had transformed my mudroom and drastically lightened the space. 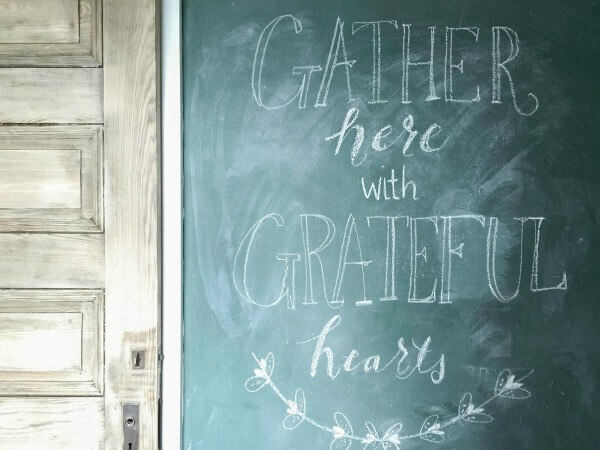 I know black chalkboards are it these days, but don’t discount the classic, and timeless look of the vintage green chalkboard. As fall approaches, I decided it was time to give it a little update. 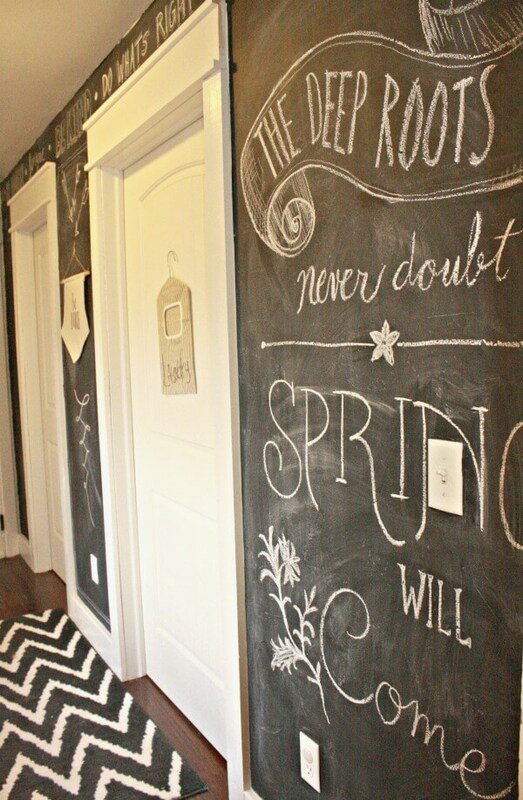 Chalkboard art can be really easy, and obviously its very forgiving since it is so easily wiped away. Don’t be afraid to try it out. “Gather here with grateful hearts” I chose it because its not necessarily an obvious fall quote, and can stand during the time that we are hovering between summer and fall. 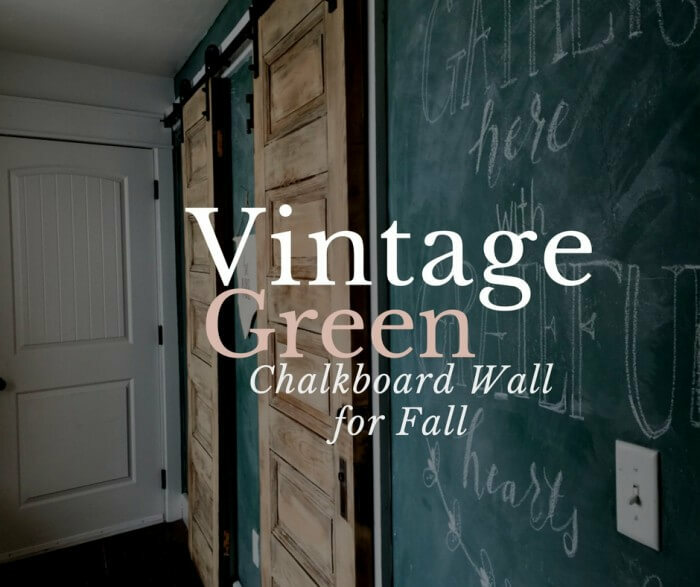 If you wont take my word for it, why not you check out some of these other amazing vintage green chalkboard wall ideas. 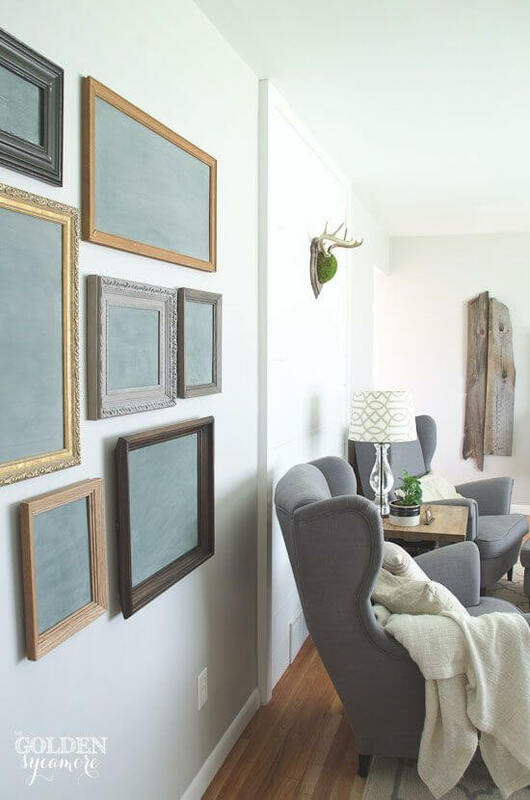 What do you think of the vintage green chalkboard wall? Is it something you would do in your own home? I’d love to hear from you. Girl! It’s amazing! A mistake turned into masterpiece!!! I love this! I would totally do this. 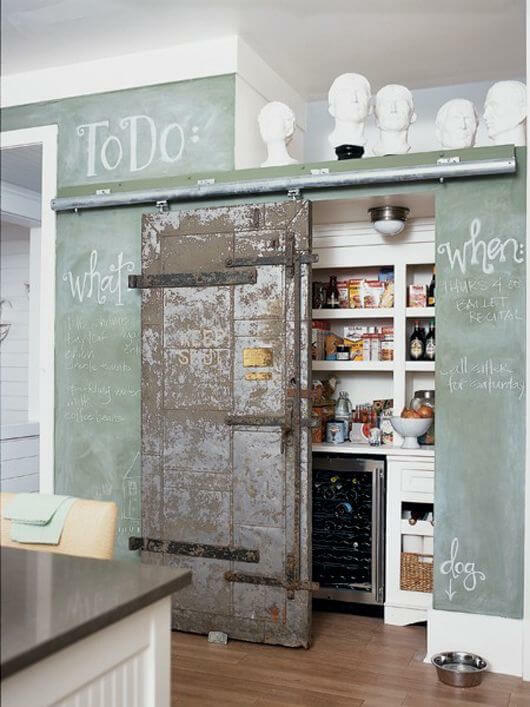 I’m loving the barn doors too. I love the green! I was going to do my dining room in dark teal at one point for color pop. Looks fantastic and fresh! #MM sharing on Fb! Thanks Kim! It was definitely outside my comfort zone. I think since it was a chalkboard, I was able to wrap my head around it! I’ve had that happen numerous times…and then when it’s really all done, it’s wonderful! You did an awesome job…change is good…. I love it too! What particular paint did you use? Was it a particular shade of green or just “green chalkboard paint”? 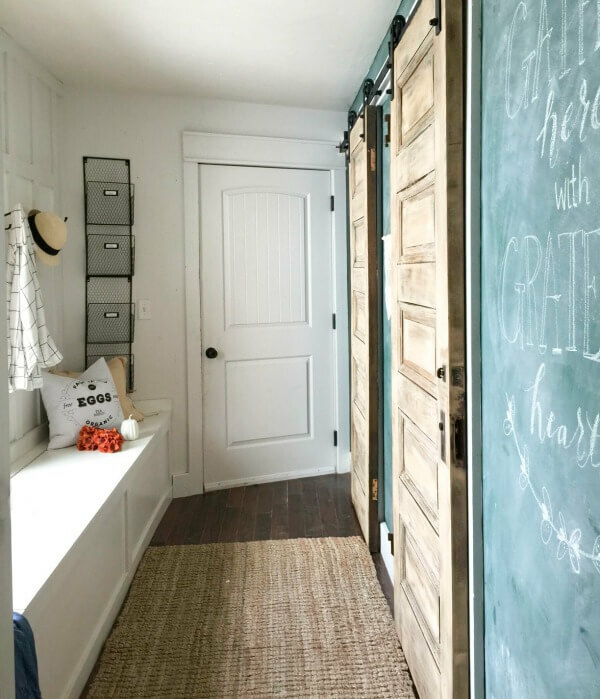 Just the green chalkboard paint from Rustoleum works! What paint/brand did you use? Thanks! I have used many simple latex house paints, that you can buy at the hardware store. I have also used craft paint, such as Plaid, or Martha Stewart.